There is a variety of collapsible colanders and strainers that can make your life in the kitchen a lot easier. Some call them foldable colanders also. It is basically the same thing. There is a difference between a colander and a strainer and to be hones I had no idea about that either. A colander can be a strainer but a strainer can not be a colander. A colander most of the time is use to strain and rinse of larger cuts and that it why it has larger holes. 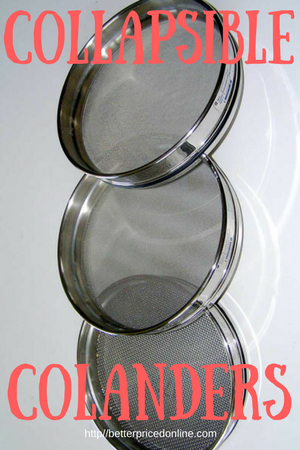 A Strainer is most of the time made of mesh and is more used for finer particles. This is however no exact science and just a rule of thumb. This collapsible colander set comes with two colanders. An 8 inch diameter that holds 2 quarts and a 9.5 inch that holds 3 quarts. This shows that this a nice size colander that can handle a lot of work, but still is very easy to handle. This fold-able colander set comes with h3 perfect fitting colanders. The sizes are: 6, 10 and 14 cups. What I like most is that they are made of silicone and not of plastic. They are easy to clean and can be washed in the dishwasher with no problem. Available in the four colors: blue, green, orange and red to fit your kitchen decorum. The heat resistance to 122 degrees makes it dishwasher safe. This colander is BPA free and I would never buy plastic with BPA so that is great. With 17 inch folded and the expanding option to over 25 inch it will fit any sink. The depth is 4.5 inches and all together it has a 6 QT capacity. We all see the advantage of having a collapsible colander over the sink. It is so easy to use and we do not have to hold it. The edge just rest on the side of the sink and we have both our hands free. The advantage is easy to see, they do not need a lot of space to store and in a kitchen there is never enough storage room it seems. Some people say it is better to by a collapsible colander set to have more sizes available, but that needs more storage space and would defeat the purpose od having a foldable or collapsible colander. My opinion is that a collapsible colander over the sink is in many cases adjustable to the size of the sink and is more versatile in its use. But again this is a personal preference. If you have collapsible colander that you recommend leave a comment below and share it with our readers.